Autoantibodies against β2-glycoprotein I (β2GPI) appear to be a critical feature of the antiphospholipid syndrome (APS). As determined using domain deletion mutants, human autoantibodies bind to the first of five domains present in β2GPI. In this study the fine detail of the domain I epitope has been examined using 10 selected mutants of whole β2GPI containing single point mutations in the first domain. The binding to β2GPI was significantly affected by a number of single point mutations in domain I, particularly by mutations in the region of aa 40–43. Molecular modeling predicted these mutations to affect the surface shape and electrostatic charge of a facet of domain I. Mutation K19E also had an effect, albeit one less severe and involving fewer patients. Similar results were obtained in two different laboratories using affinity-purified anti-β2GPI in a competitive inhibition ELISA and with whole serum in a direct binding ELISA. This study confirms that anti-β2GPI autoantibodies bind to domain I, and that the charged surface patch defined by residues 40–43 contributes to a dominant target epitope. Autoantibodies that bind β2-glycoprotein I (β2GPI)4 are recognized to be strongly associated with the antiphospholipid syndrome (APS) (1, 2, 3). Abs detected by the anticardiolipin (aCL) assay from patients with clinical features of APS generally bind to β2GPI, but samples from patients with other causes of a positive aCL assay, such as a variety of infections, do not (4). Likewise, lupus anticoagulant activity in APS patient plasma is often due to anti-β2GPI Abs (1). Knowing the location of an epitope for pathogenic Abs may permit the design of therapeutic agents able to act as toleragens for the specific B cells producing the autoantibodies (5). This would provide a far more specific approach to treatment than the anticoagulation or general immunosuppression currently used in APS. β2GPI is a member of the short consensus repeat protein family, which is characterized by repeating domains of ∼60 aa with two disulfide bridges. β2GPI has five domains; the amino-terminal first through fourth domains are typical, and the fifth domain contains an extra ∼20-aa C-terminal loop ending in an extra terminal disulfide bond and a lysine-rich region that functions as the major anionic phospholipid binding site (6, 7). The recent structure of β2GPI, as determined by x-ray crystallography, shows that it has a J shape (8, 9). This suggests that the base of the J shape containing domain 5 provides the membrane binding interface. The remaining domains thus extend progressively away from the phospholipid surface. In this situation domain I would have the greatest exposure and accessibility (8, 9). No specific function has been ascribed to domains I–IV. The identification of which region(s) of β2GPI is bound by autoantibodies has been the subject of some debate (10, 11, 12, 13, 14). Wang et al. (10) tested several human mAbs generated from patients with APS that bound to cardiolipin in the presence of β2GPI. Several short peptides containing sequences from domain V of β2GPI enabled these mAbs to bind to cardiolipin or inhibited binding of mAb to β2GPI. However, polyclonal autoantibodies from APS patients did not bind these peptides. It was suggested that these mAbs bound epitopes on domain V. Arvieux et al. (15) identified patients who had anti-β2GPI Abs that were aCL assay negative and inhibited the binding of β2GPI to cardiolipin, suggesting binding to the cardiolipin binding site on domain V of β2GPI. Yang et al. (13) have recently described direct binding of autoantibodies from patients with systemic lupus erythematosus to a recombinant domain V-GST fusion protein. However, contrary to the studies of Arvieux et al. (15), these patient samples were also aCL assay positive. Several studies have used recombinant mutants of β2GPI with one or more domains deleted (11, 12, 16). Igarashi et al. (16) found that several mouse and human monoclonal β2GPI autoantibodies bound to wild-type β2GPI, domains I–IV (i.e., the deletion mutant containing only domains I–IV) and, to a lesser degree, to domains I–III, but not mutants without domain I. This was interpreted to suggest that domain IV may play a critical role in exposure of the cryptic epitope. Using these mutants and purified anti-β2GPI from four APS patients, George et al. (12) found binding to domains I–IV, but not domains I–III or domains II–V. Three mouse mAbs, two of which were reported to bind to domain IV, were used in competitive inhibition assays. Binding of one of the two anti-domain IV mAbs was inhibited by three of the four patient anti-β2GPI preparations. These findings were interpreted as demonstrating that domain IV contains the epitope site for human anti-β2GPI (12). Using a single point and a triple point domain IV mutant, Koike et al. (17) found significantly decreased binding of anti-β2GPI to both mutants in an ELISA, again suggesting domain IV as the site of the epitope(s). Other studies using domain-deleted mutants of β2GPI reached different conclusions. Using anti-β2GPI purified from 11 patients with APS, significant competitive inhibition of binding to the wild type could be demonstrated using all mutants containing domain I, most importantly including domain I alone, but there was little if any inhibition using mutants without domain I (11). In a direct binding ELISA study in which the wild-type and domain-deleted mutants were coated onto irradiated polystyrene plates, sera from 21 patients with anti-β2GPI Abs were also shown to bind to full-length β2GPI and to the domain I–IV mutant at the same level. In only three was there any degree of binding to domains II–V (14). These studies suggested that domain I, not domain IV or V, is the dominant epitope site on β2GPI for anti-β2GPI autoantibodies from the majority of APS patients. This present study used recombinant wild-type β2GPI plus variants with single point mutations in domain I in both direct binding and competitive inhibition ELISAs. This was done firstly to attempt to better localize the epitope, and secondly to address the possibility that the deletion of entire domains in the previous studies resulted in conformational changes elsewhere in the protein, which could potentially affect autoantibody binding and/or the coating characteristics on ELISA plates (11, 14). Using these domain I point mutants we have examined the binding of anti-β2GPI autoantibodies in a wide range of ELISA conditions, with two separate groups of anti-β2GPI patient samples. In one laboratory (La Jolla Pharmaceutical Co.) the domain I point mutants were examined for their ability to competitively inhibit the binding of affinity-purified anti-β2GPI autoantibodies from binding to wild-type β2GPI. The competition assays were performed using both irradiated and Maxisorp microwell plates (Nalge Nunc International, Roskilde, Denmark). In the other laboratory (St. George Hospital) a separate panel of serum samples with anti-β2GPI autoantibodies was examined for binding to wild-type and domain I single point mutant β2GPI coated directly onto irradiated plates. Autoantibodies binding β2GPI were purified from 15 patients with APS. No patient selection criteria were applied other than the availability of sufficient volume and titer to yield an adequate amount of affinity-purified Ab for the inhibition studies. Anti-β2GPI was affinity-purified by sequential fractionation with cardiolipin-containing liposomes, then protein A- agarose beads, as previously described (11). Serum samples were screened with an in-house and a commercial anti-β2GPI ELISA (INOVA Diagnostics, San Diego, CA). Samples scoring above normal with the in-house assay and >40 U in the commercial assay (normal is <20 U) were selected for further study. MaxiSorp microplates (Nunc) and irradiated microplates (10 kGy; ICN, Costa Mesa, CA) were coated overnight at 4°C with 50 μl of full-length recombinant β2GPI at 10 μg/ml in 0.1 M carbonate, pH 9.5, then washed three times with 0.15 M PBS, pH 7.2, and blocked for 1 h at room temperature with 75 μl of 2% nonfat dried milk (NFDM) and PBS. Each Ab preparation was titrated to determine the concentration required to produce ∼80% maximum binding, typically between 2.5 and 10 μg/ml. Test inhibitors (wild-type or domain I point mutants) were diluted to the required concentration in 2% NFDM, or 2% NFDM alone was added to coated wells. Affinity-purified anti-β2GPI Ab was diluted in 2% NFDM, and 25 μl of a constant concentration was added to the wells. The contents of the wells were mixed, and the plates were incubated at 37°C for 1 h. The plates were washed three times with PBS, then 50 μl of alkaline phosphatase-conjugated anti-human IgG or anti-mouse IgG (γ-chain specific; Zymed, South San Francisco, CA) diluted in 2% NFDM was added and incubated at 37°C for 1 h. The plates were washed three times with PBS, 50 μl of alkaline phosphatase chromogenic substrate was added, and the plates were incubated for 30 min at room temperature. The A550 was measured in a microplate autoreader (Bio-Tek Instruments, Winooski, VT). The percent inhibition was determined as follows: [(mean A550 obtained from the control wells without inhibitor less A550 of background) −(A550 obtained in the presence of inhibitor less A550 of background)/(the mean A550 obtained from the control wells without inhibitor less A550 of background)] × 100. Each inhibitor was tested at seven different concentrations, allowing an inhibition curve to be constructed. This was then used to calculate the amount of mutant or wild-type β2GPI required to give 50% inhibition (IC50). The IC50 of each mutant was expressed as a ratio with the IC50 of wild-type β2GPI for each anti-β2GPI tested. Flat-bottom microtiter polystyrene plates (ICN Biomedical) were used after gamma irradiation to 10 kGy (7). Preparations of β2GPI were wild-type β2GPI and 10 mutants with a single point mutation in domain I, as described above. The washing buffer was 1 M NaCl, 20 mM sodium phosphate buffer adjusted to pH 7.2 plus 0.1% (v/v) Tween 20, and the blocking buffer comprised wash buffer with the addition of fatty acid-free 1% (w/v) BSA (Sigma-Aldrich, Sydney, Australia). The final wash was with 0.15 M NaCl and 20 mm sodium phosphate, pH 7.2, without Tween 20. Second Abs were alkaline phosphatase-conjugated goat anti-mouse IgG, anti-human IgG, or anti-human IgM (Sigma-Aldrich). The colorimetricsubstrate was p-nitrophenyl phosphate (Sigma-Aldrich; 1 mg/ml) in 1 M diethanolamine and 0.5 mM MgCl2, pH 9.8, and reading was performed in a TiterTek Mulitskan MCC instrument (Eflab, Espoo, Finland) at A405. The wild-type and point mutant β2GPI preparations were coated at 10 μg/ml in 50 μl/well of 50 mM sodium carbonate/bicarbonate buffer, pH 9.6, at 4°C overnight, a concentration that ensured adequate Ag coating to enable patient autoantibodies to bind as previously determined (14). The wells were washed three times with 200 μl of wash buffer, blocked with 200 μl of blocking buffer for 1 h at 4°C, and washed three times. Patient serum, diluted 1/100 in blocking buffer, was added and incubated for 2 h at room temperature, then wells were washed three times. Where mAbs were used these were at the stated concentration diluted in blocking buffer. The appropriate alkaline phosphatase-conjugated anti-Ig was diluted 1/1000 in blocking buffer, and 50 μl/well was added and incubated for 2 h at room temperature. The plates were washed three times with wash buffer, then once with final wash buffer, before 50 μl/well of prewarmed substrate was added and incubated in the dark at 37°C. Patient samples were read 30 min after the addition of substrate. Assays were accepted if the positive standard control was within 10% of 1.5 absorption units (AU), and the normal serum control within the normal range. All samples were tested in parallel in duplicate wells. All samples tested against point mutants were also tested against the wild type at the same time. Assays with mAbs were read when the positive control OD was in the range 1.5–1.9 AU. The direct binding ELISA was reproducible with an intraassay coefficient of variation of 5.3, and an interassay coefficient of variation of 2.6% for the positive standard and of 8.4% for all samples. Forty normal blood donors had a mean of 0.081 AU and an SD of 0.054 AU. The mean ± 5 SD (0.353 AU) was used as the cut-off for abnormality. 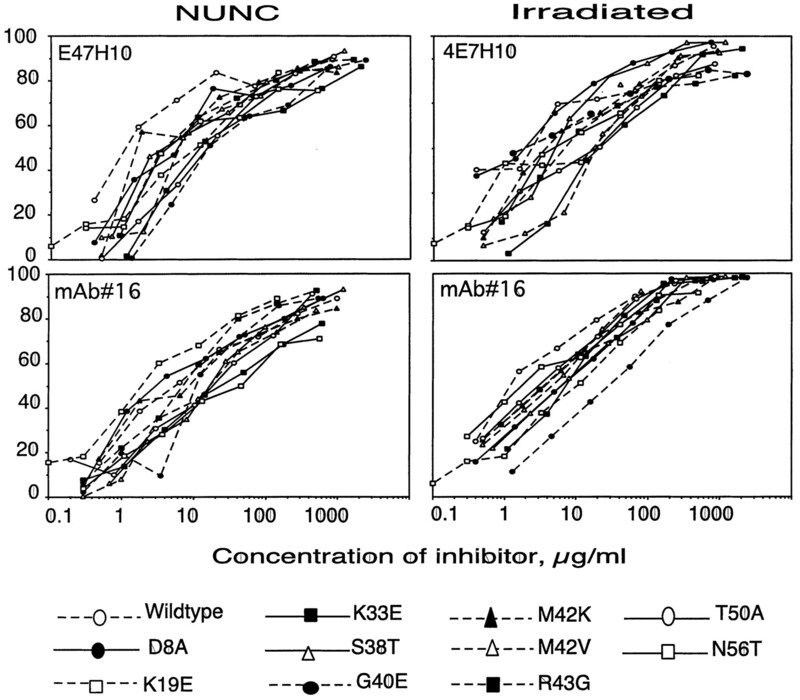 mAbs 1, 10, 11, and 16 were obtained from immunized mice and were used at 0.1, 0.2, 0.1, and 0.2 μg/ml, respectively. mAbs 1, 11, and 16 bind domain I, while mAb 10 binds domain IV (18). mAb FC1, used at 1 μg/ml, is an IgG that binds domain I and was obtained from an autoimmune NZW × BXSB F1 mouse (19). FC3 is an isotype-matched non-β2GPI-binding control from the same mouse. IgM mAbs EY2C9 (anti-β2GPI) and TH1B9 (negative control; a gift from Dr. T. Koike) were used at 2 μg/ml and were derived from an autoimmune patient as previously described (20). mAb 4E7H10 was obtained from mice immunized with a domain I-keyhole limpet hemocyanin conjugate. Three-dimensional models of the first domain of β2GPI were calculated using a method of comparative modeling by satisfaction of spatial restraints implemented in the MODELLER program (21). Ten different models were produced for each point mutation based on the x-ray structure of the native β2GPI (Protein Data Bank code 1c1z (8)). The final models of each point mutant were selected based on the value of the MODELLER objective function (21). To study changes in antigenicity caused by point mutations in the β2GPI sequence, the surface electrostatic potentials of the native structure and the mutant models were calculated with the GRASP program (22) using the atomic charges from the CHARMM22 force field (23). To further examine the epitope(s) recognized by these autoantibodies we made full-length recombinant β2GPI proteins with single point mutants in domain I. First we determined which, if any, of the amino acid positions in domain I of β2GPI are important for autoantibody binding by screening filamentous phage-displayed peptide libraries in which mutants of domain I were expressed as an amino-terminal fusion with the pIII protein. The mutations were created by error-prone PCR, such that an average of one mutation in domain I was generated in each phage clone. A phage micropan assay was used to screen individual phage for the ability to bind affinity-purified Abs from patients with antiphospholipid syndrome. Using this approach we rapidly identified phage with missense mutations covering approximately half the 63 domain I residues. This allowed us to identify a number of mutants that adversely affected Ab binding. Ten mutants, some of which affected Ab binding and some of which did not, were chosen for further study as follows: D8A, K19E, K33E, S38T, G40E, M42K, M42V, R43G, T50A, and N56T, where the nomenclature of D8A signifies a change from D to A at position 8. These were incorporated into full-length β2GPI mutant proteins produced in insect cell cultures as previously described (11). mAbs were used to assess the ability of the point mutants to coat the wells of gamma-irradiated microplate wells. Both mouse anti-domain IV mAb 10 and mouse anti-domain I mAb 16 showed no reduction in binding to the point mutants compared with wild type, suggesting similar microplate coating for each mutant (Fig. 1⇓). The autoimmune mouse mAb FC1 showed a 20% increase in binding to T50A, but otherwise similar binding compared with the wild type. The binding of the human mAb EY2C9 to mutant T50A was negligible and was reduced by >50% to G40E, M42K, and R43G. The results suggest that the antigenic epitope recognized by EY2C9 is located on domain I. Binding of anti-β2GPI mAb to wells coated with wild-type β2GPI and domain I point mutants. Binding is displayed as a percentage of binding to the wild type in parallel. Abs FC1, 10, and 16 are mouse mAbs, and EY2C9 is a human Ab. Serum samples from 27 APS patients were similarly tested for their ability to bind each of the point mutants and wild-type β2GPI adsorbed onto gamma-irradiated microplate wells. The patient samples showed a decreased binding to several point mutants, in particular to those with mutations between G40E and R43G. 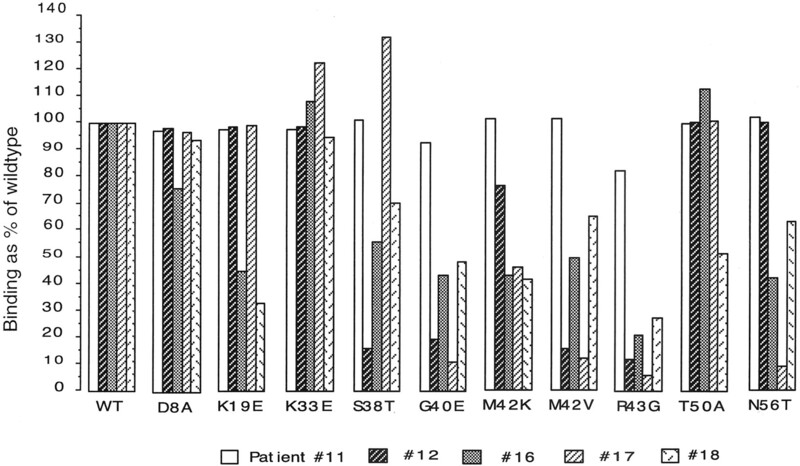 The results from five patients are shown graphically in Fig. 2⇓, and the results for all 27 samples are tabulated in Table I⇓. A majority of the samples (60%) had a >50% decrease in binding to R43G compared with the wild type. Nine sera (33%) showed a >50% decrease in binding to K19E. Two sera (no. 12 and 17) showed little to no binding to the G40E, M42V, and R43G mutants while displaying very good binding to the remaining seven single point mutants and the wild type. Antisera from five selected patients were tested for their ability to bind to wells coated with recombinant β2GPI, each with a single amino acid substitution in domain I. Binding is displayed as a percentage relative to wild-type binding. Wild-type β2GPI and 10 different mutants were tested for their ability to inhibit mouse mAbs 4E7H10 and 16 from binding to wild-type β2GPI immobilized on ELISA plates (both Nunc MaxiSorp and irradiated polystyrene). These mAbs were chosen because they recognize conformational epitopes on domain I and because they bind to different epitopes than the human autoantibodies (data not shown). The results (Fig. 3⇓) show that on both types of ELISA plates all 10 mutants inhibited the binding of both anti-β2GPI mAbs to wild-type β2GPI. The IC50 for each of the single point β2GPI mutants was within a 10-fold range of the wild-type value. This suggests that the single amino acid substitutions in domain I did not alter the overall conformation of the domain, inasmuch as that part of the domain recognized by these two mAbs remained unaffected. Competitive inhibition of anti-β2GPI mAbs with domain I point mutants. The percent inhibition was determined and plotted as a function of that concentration. Each graph is labeled, in the upper left corner, with the mAb used. The same mutants were also tested, in a dose-dependent fashion, for their ability to inhibit affinity-purified APS patient autoantibodies from binding to wild-type β2GPI immobilized on both Nunc and gamma-irradiated ELISA plates. The amount of each of the mutants required to give 50% inhibition was divided by the amount of wild type required to give 50% inhibition. This value, a fold increase, was used as a quantitative measurement, so that thereactivity of each mutant could be compared from one Ab sample to another. The complete inhibition results from two of the Ab preparations are shown graphically in Fig. 4⇓, and the tabulated results of all 15 of the autoantibody preparations tested are shown in Table II⇓. The data show that most of the mutants were generally within 10-fold of the wild-type β2GPI concentration in their ability to achieve 50% inhibition. By contrast, the G40E and R43G mutant β2GPI proteins were much less effective in inhibiting the autoantibodies than was wild-type β2GPI, and in most cases were unable to achieve 50% inhibition at concentrations up to 1000-fold greater than that required for the wild type. 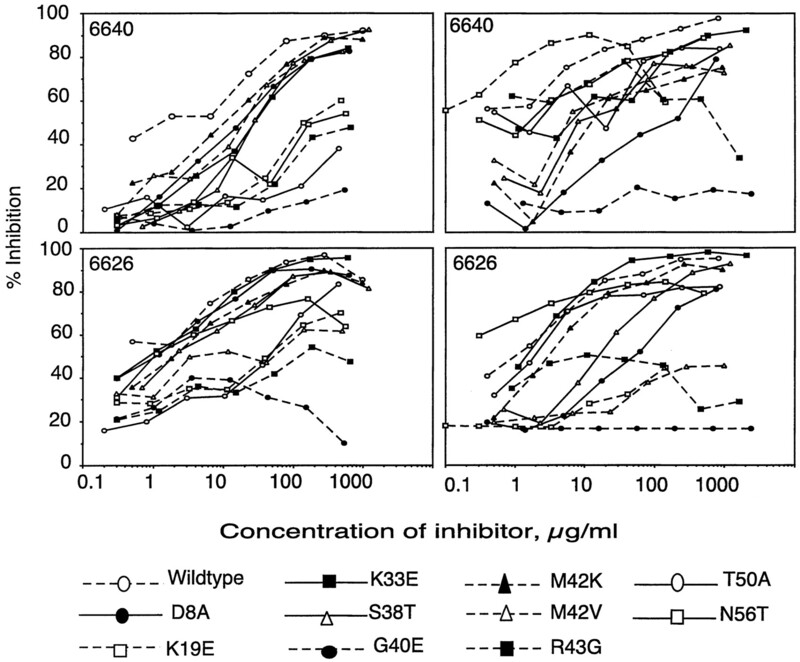 The K19E mutation generally required concentrations 10- to 500-fold greater than wild-type β2GPI to achieve 50% inhibition. Same as in Fig. 3⇑, except human Abs were used for these graphs. Eight of the affinity Ab preparations were also analyzed by direct binding. The results, tabulated in Table III⇓, show results similar to those obtained in the competitive inhibition assays. The amino acids R43 and G40 are exposed to solvent and located close together on one face of β2GPI domain I. Comparative modeling and electrostatic calculations of the G40E and R43G mutants predict an alteration of the surface shape and electrostatic charge of domain I. The disrupted region includes both a protruding mobile loop and the adjacent concave surface (Fig. 5⇓). The surface electrostatic potential is displayed for B2GPI domain I wild type (top), G40E mutation (bottom left), and R43G (bottom right), as shown by the color bar (in units of kT; 1 kT unit = 0.58 kCal/electron mol). Arrows point the location of the amino acid substitutions. This study was designed to test the conclusions of our earlier report, which showed that autoantibodies from APS patients recognize antigenic epitopes on domain I of β2GPI (11). In that report we used a competitive inhibition ELISA employing a panel of whole domain deletions in recombinant β2GPI. It is possible that the deletion of whole domains might have altered the conformation of the remaining domains in such a way as to prevent the binding of autoantibodies, thereby giving a false impression of their domain specificity. In this study we employed only full-length β2GPI (all five domains), each having a single amino acid substitution in domain I. These single point mutants were compared with full-length wild-type β2GPI for their ability to bind anti-β2GPI autoantibodies from APS patients. mAbs were used in both direct binding and competitive inhibition assays to assess whether the selected mutations in domain I altered the conformation of the molecule. With one exception (APS patient-derived mAb EY2C9), binding of mAbs was unaffected by single amino acid substitutions. These results confirm that the overall conformation of β2GPI was not changed. The data further show that the substituted amino acids are not critical components of the epitopes recognized by the mouse mAbs. Importantly, the data show that all the mutants were coated equally on the microplate wells in the direct binding assays, as mouse mAbs FC1, 10, and 16 bound equivalently to wild-type β2GPI and to each of the mutants. Contrary to this finding, binding of human mAb EY2C9 was affected by a number of mutations in domain I. There was essentially no binding to T50A and markedly decreased binding to the mutations at aa 40–43. Paradoxically, EY2C9 was previously reported to bind domain IV (17). The current study strongly supports localization of an epitope for EY2C9 on domain I.
Autoantibodies from patient sera were also affected by mutations in domain I, particularly in the region of aa 40–43 (G40E, M42V, and R43G). With some patient sera there was a reduction in direct binding by 80–90% relative to wild-type β2GPI (Table I⇑). In the competitive inhibition studies the same mutants were generally unable to achieve 50% inhibition at concentrations 1000-fold higher than required with the wild type (Table II⇑). These data clearly show that domain I contains the dominant epitope(s) for anti-β2GPI associated with APS. While there are some differences in the results from the two different assay methods, the overall pictures from both are similar. The main difference is that mutation K19E had a greater effect in the direct binding assays than in the competitive inhibition assays. However, autoantibody binding to K19E was diminished in both assays. It is unclear whether K19 is part of the same epitope as that affected by G40E and R43G for some Abs, if K19E affects other amino acids that are part of that epitope, or if K19E affects a second, distinct epitope. The conformation of a region in a protein can be altered by a point mutation to a degree that depends on the specific substitution and the residues adjacent to that substitution (24). Modeling of domain I predicts that the G40E and R43G mutations are surface exposed, and they are likely to induce conformation and electrostatic changes over a surface region of the domain, as shown in Fig. 5⇑. 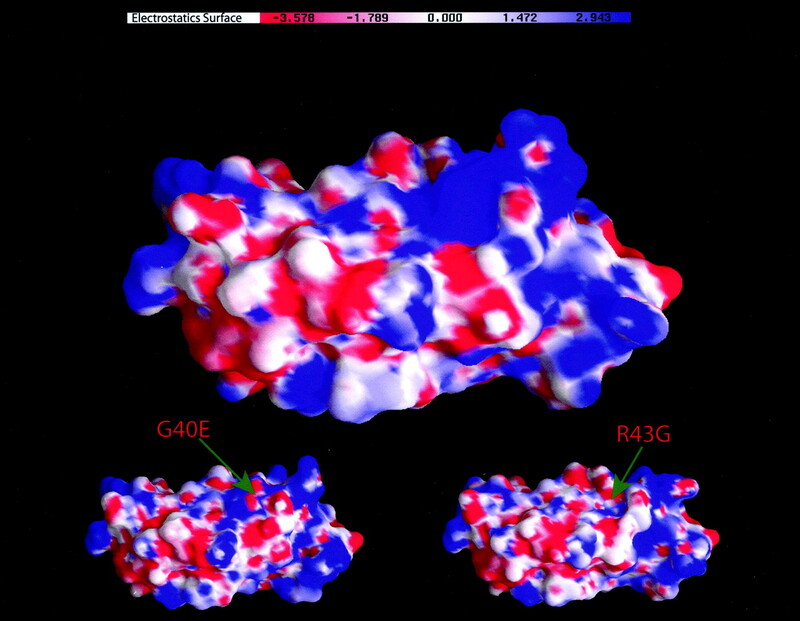 The altered area of the domain is therefore likely to contribute significantly to the Ab-Ag binding either because G40 and R43 are themselves critical residues of the epitope or because the substitutions at these points affect the conformation of the nearby critical residues. The autoantibodies and the mAbs do not bind to reduced and alkylated domain 1 (data not shown), further suggesting that the epitope(s) is conformational and not linear. A similar restriction of autoantibodies to a single immunodominant region has been shown for other autoantigens, such as thyroid peroxidase (25). Given that potential epitopes would be expected to be found over much of the protein (26), this restriction of autoantibody repertoire found in both our study and another suggests that generation of autoantibody-producing B cell clones is influenced by other factors in addition to the availability of epitopes. In conclusion, this study has shown that single amino acid substitutions in domain I of full-length β2GPI disrupt autoantibody binding to β2GPI. This was demonstrated with competitive inhibition and direct binding assays. The competitive inhibition method used mutants in fluid phase to circumvent difficulties with ensuring adequate Ag binding to the solid phase of the microplate well. This study provides strong support for the hypothesis that the epitopes for anti-β2GPI autoantibodies from patients with APS are located on domain I of β2GPI. Amino acids 40–43 form a surface-exposed region that contributes to the immunodominant epitope. We thank Jackie Crisologo, Merle Hayag, and Eric Smith for expert technical assistance, and Prof. T. Koike for providing mAbs EY2C9 and Th1B9. ↵1 This work was supported in part by the National Health and Medical Research Council of Australia. This work was partly supported by National Institutes of Health Grant GM54762. A.S. is an Irma T. Hirschl Trust Career Scientist. ↵2 G.M.I. and S.R. contributed equally to this work. ↵4 Abbreviations used in this paper: β2GPI, β2-glycoprotein 1; aCL, anticardiolipin; APS, antiphospholipid syndrome; AU, absorption units; NFDM, nonfat dried milk.